First thing’s first: what’s the difference between porridge and oatmeal? The way I see it, oatmeal is a kind of porridge. I think the true definition of a porridge is any warm cereal that’s prepared with grains, so porridge could be a hot cereal made from, say, spelt and barley or millet and rye (I have a great recipe for a 5-Grain Porridge in the cookbook, which I think you’ll really love). For our purposes today, for all you purists out there, this is technically an oatmeal but could be called a porridge as well. Now I didn’t grow up eating oatmeal or porridge; we had a lot of frozen waffles, toast and cold cereal — quick breakfasts that two working parents could easily get on the table or into our hands before my sisters and I jetted off to our respective schools. But as an adult I came to love oatmeal. I started with the quick Quaker packets in college because they were easy and I could take them on the go, but in my late twenties when I realized how much sugar those little packets contain, I started making my own mixes and realized how nourishing and satisfying steel cut oatmeal and porridge can be when made slowly on the stovetop. A common complaint with oatmeal is that it’s mushy and gluey, and I’ve certainly had my fair share of this type of warm cereal. But when I moved in with Sam, he introduced me to the fine (and simple) art of toasting your oats in a little bit of butter before making your porridge. This draws out their nutty flavor but also helps them keep their integrity in the hot cooking liquid so they don’t just collapse into one another. It’s the only way we do it around here. Oats need a little bit of real estate. Don’t we all? No, but really, if you can use a large pot to allow your oats to sit in a nice, single layer you’ll end up with a more toothsome porridge than if you used a small pot where they’re all jammed on top of one another and you have to stir more frequently (see #4 below for an explanation). It seems odd and a waste of a large pot, but trust me on this one. The less time the oats have to hang out with cold water, the better. When I make oatmeal and add the oats and cold water together and bring them to a boil — my porridge is always on the gummier side than if I add the toasted oats right into the hot water. I know there’s science involved here in some regard, but I suppose it just makes sense that you don’t want to soak your oats in cold water as they’re heating up — they’ll have that much more time to soften before really cooking — not really what we’re going for here. Somewhere at some point in time (maybe with the resurgence of polenta popularity? ), people began to think that you should really vigorously stir your oatmeal and porridge. If you do this, you will 100% of the time have gummy, unglamorous porridge. Stirring oats (and most grains) will slowly break them down; they’ll lose their shape and delicious, slightly chewy porridge will elude you forever. I think of oatmeal and porridge much like I do cookies: You know how when cookies cool, they almost always become firmer? When oatmeal and porridge sit off the heat source, they seize up slightly and firm up which isn’t what most of us look for in the perfect bowl of warm cereal. I tend to add a bit more cooking liquid than some recipes require, am never afraid to keep adding liquid to get the porridge where I’d like it to be, and always pull it off the heat once the oats are soft and chewy — but also, while the porridge still seems a little looser than you think it should be. That way, by the time you’re serving it up into bowls, it will be just right. 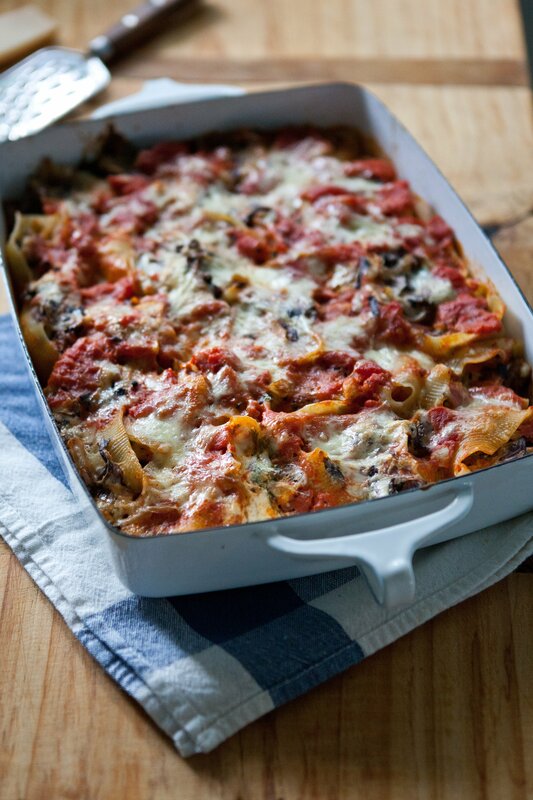 Can You Really Reheat Leftovers? Yes, yes and yes! I know that it seems like there’s no way day-old porridge could be any good but add a good glug (or two or three) of liquid like almond milk, milk or even water and heat it very slowly on the stovetop only stirring as need be to incorporate the liquid and loosen up the oats — and reheated oatmeal and porridge is almost as good as the first day. We just had some this morning, in fact. Now before we get to this wintery breakfast recipe, I wanted to give you a peek inside my cookbook, Whole-Grain Mornings. I realize I’ve done kind of a sporadic job of talking about it here, and I probably could’ve been more deliberate and organized in sharing the process with you all. Remember when we talked about the photo shoot … and way back when when I announced the project? Well the day is almost here: the book comes out December 31st (although I’ve been telling people January 1st because I like the symbolism of a whole new approach to breakfast for the new year). My publisher, Ten Speed Press, put together a PDF that gives you a peek, demonstrating how the book is organized seasonally with both sweet and savory breakfast recipes using whole grains and natural sugars. Sam also designed a beautiful, beautiful website for the book where you can learn more about purchasing (you can pre-order now and it’ll ship soon!) and find out where I’ll be this winter/spring promoting it (I hope you’ll come out, all you Seattleites, Portlanders, San Franciscans and Vancouver-dwellers; I’d love to meet you all). While there is so much more I could say about the book here, I’ll just close by saying that we’ve been cooking from it quite a bit lately — ever since getting the galley in the mail (and now we have a real copy that’s slowly getting marked up and bookmarked). When all the recipes lived on my computer, it seemed more like work to pull them up and cook from the screen but now that I have a real-life copy of the book, I’ve been moving back into the pages and back into the seasons and making myself at home. I think that’s a good sign — maybe the best sign– if I pull up a chair after spending so much time with these recipes and pages, I so hope that you’ll pull one up, too. Come Visit: The Book Tour! I love this cranberry-ginger sauce and made a similar version for Thanksgiving dinner a few years ago. At the time, I started spooning leftovers into my morning yogurt and oatmeal — the double hit of ginger adds warmth and the citrus adds a brightness that elevates morning oats into something truly special. 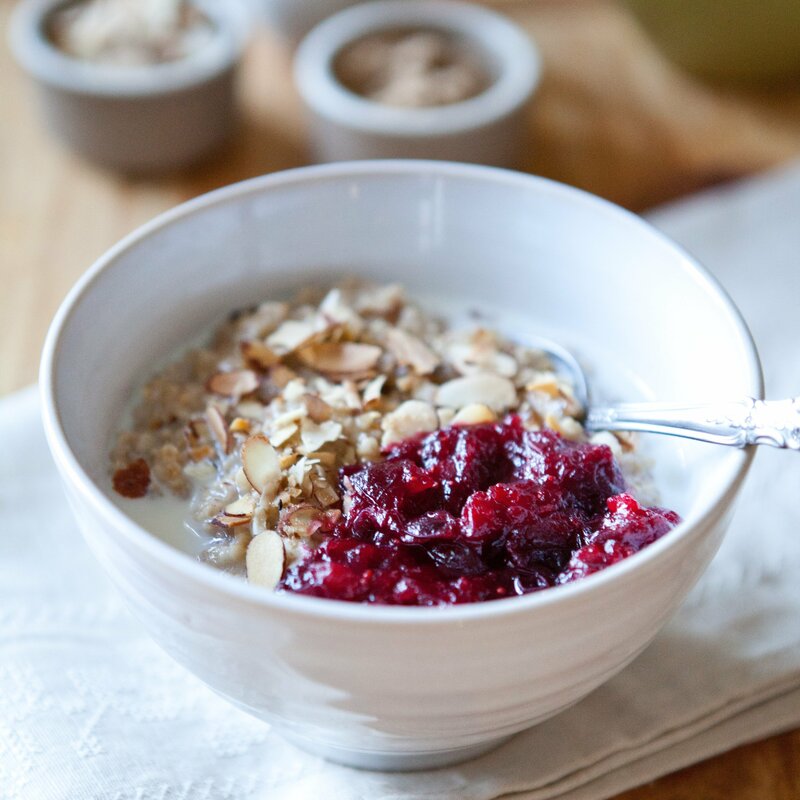 You will likely have a little more cranberry-ginger sauce than you’ll need for the amount of porridge here, which is a good thing as it’s wonderful spooned on top of just about anything or slathered onto rustic toast. You can make the sauce up to two days in advance. For the Oats: In a large sauté pan, melt the butter and add the steel cut oats. Toast for 4-5 minutes on medium heat or until fragrant (will smell slightly nutty). In a large heavy-bottomed pot, bring the almond milk, water, salt, cinnamon, ginger and nutmeg to a slow boil over medium heat. Add the toasted oats and gently stir to incorporate them into the liquid. Return to a boil, then partially cover the pot and decrease the heat to low, cooking until the porridge has thickened and the oats have softened, about 25-30 minutes. You’re looking for a porridge that will be a little loose when you pull it off the stove – it will continue to thicken off the heat. For the Cranberry-Ginger Sauce: Bring the cranberries, honey, brown sugar, cinnamon stick, ginger, cloves, and orange juice to a simmer in a medium saucepan. Cover the mixture and allow it to cook on medium-low heat for 5-7 minutes, or until the cranberries are just beginning to burst and you notice the mixture thickening. Add the chopped candied ginger and orange zest and stir to combine. Simmer uncovered for an additional 1 to 2 minutes, or until cranberries have burst and are softening into more of a sauce (it will continue to thicken off the heat, too). Remove the cinnamon stick. If you like a looser sauce, add water, 2 tablespoons at a time. To serve: Ladle large spoonfuls of porridge into bowls and top with toasted almonds, cranberry sauce and a little cream if you like (we do). This is going to be such a great book! I love your porridge tips and I do the same with toasting in butter and adding more liquid. A great breakfast for this morning. Most Finns eat porridge for breakfast every morning. For some reason although I really love a good porridge I've never been the one waking up and starting to stir in my porridge pot… Maybe it's because we never made porridge for breakfast at home. 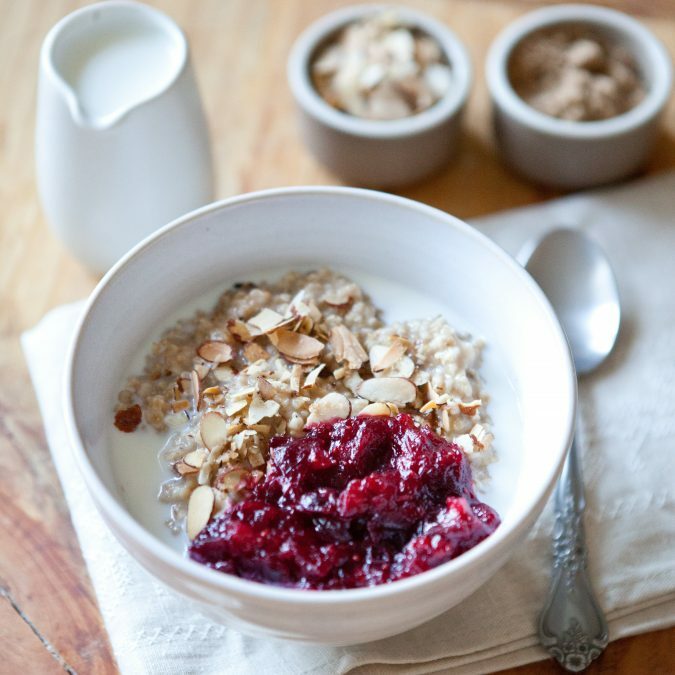 This post however inspires me so much to whip up a porridge breakfast! I'm so intrigued by the idea as it's snowy and cold outside. 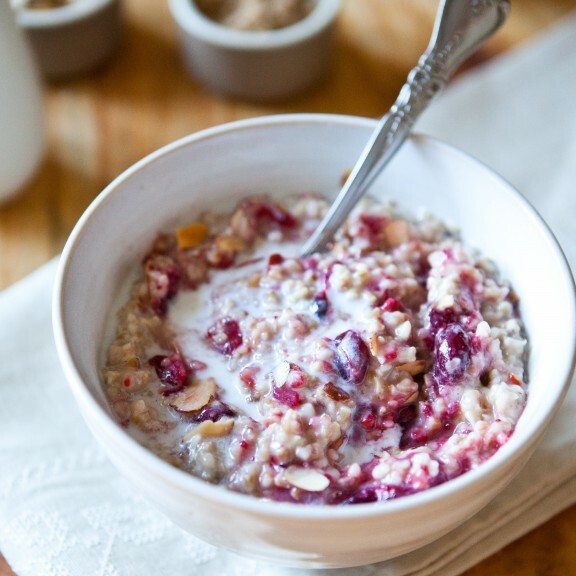 A warm bowl of porridge…Yes, please! Thanks, Kasey!!! Your copy should be coming your way so soon! Can't wait to hear what you all think of it. And I had to chuckle when I saw your breakfast photo recently ... it's a sign we need to see each other in person and catch up one of these days! I didn't even like oats & any kind of porridge until last year. I'm sure some childhood trauma of eating plain and poorly cooked oats had something to do with it, while now I've learned to love them. Can't wait for your cookbook to come out! This makes me want to eat oatmeal for dinner...now if I could just convince my husband. Pre-ordered my cookbook - can't wait. Because of a restricted diet (pre diabetes), I don't use butter. I will try extra virgin olive oil or canola. Thanks for this tip. I make an oatmeal (also large pot, no measurements, enough for 4 mornings/snacks) by cooking the steel-cuts, til they're crunchy yet soft, putting into a colander and rinsing them thoroughly. This makes them into something entirely different. I've done this for years, and often eat them (microwaving) with savory items, in summer it's tomatoes, mozzarella, arugula, evoo, Spanish sherry vinegar & an Asian bottled marinade; now I use tofu cut up, green vegetables or squash cubed. with some sweet onion on top. Like eating wild rice but much healthier. Lovely recipe and I just pre-ordered your book. Can't wait to get it. Thank you. Whenever I can I like to make steel cut oats in the slow cooker. I use a bowl that will fit inside the slow cooker, add the oats,water,and a touch of salt, then slow cook on high for 4 hrs. They are delicious and you have extra for re-heating another day. I love this idea, Leia. I have to admit, I'm a dunce with the slow cooker. I actually tested an oatmeal recipe using the slow cooker for the book and continued to fail with it -- it was always a little crusty on top and just not as creamy and delicious as when I made it on the stovetop. BUT I'm going to give your method a whirl. After all, it is winter and time to dust the old gal off. yayayaya! Oh I can't wait to hold it in my hot little hands. Much like you, I grew up on quick bfasts and oatmeal packets (I can still remember the costco variety pack). I do enjoy the real stuff now, but don't make it too often. Excited to apply your tips. Lovely photos too. Congrats my friend, the big day is upon us!!! What an accomplishment Megan! Congratulations! 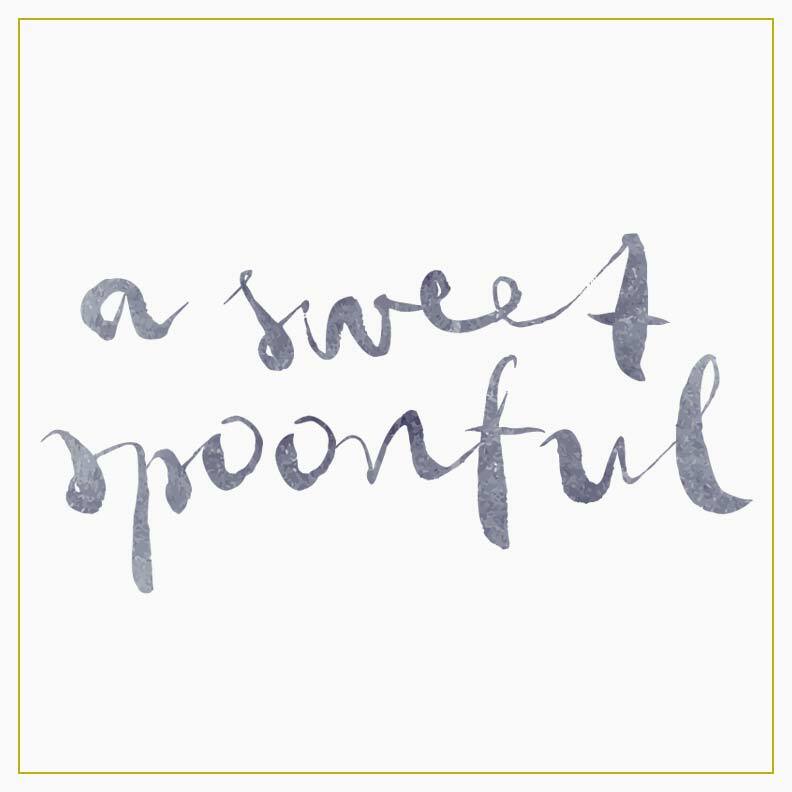 The book looks amazing (can't wait to order it), the website is beautiful, and this porridge recipe is perfect. I love steel-cut oats (usually cook them after soaking overnight), and am always looking for new flavors and fail-proof methods. So your tips will become my go-to instructions. I have had great success cooking rolled oats in a rice cooker. Great for college students and anyone who ditzily forgets about the oats on the stove until they smell burning! Have only tried in a mini 2 cup rice cooker but should work in a regular size one. Fascinating! I would've never thought to try that, Beryl. Thanks so much for the tip! We're big hot cereal folks at my house but I've always avoided porridge! I look forward to trying this recipe and cracking open your book (pre-order on my Xmas list). I've been following your blog since early 2010 and I'm just thrilled for you and the new book! Holy fondue, honestly I thought I knew it all about porridge/oatmeal, and turns out I was just a rookie! For starters, I thought oatmeal was the American word for porridge, and I always used a small pot and stirred rigorously! The other game-changer was roasting beforehand. I'm excited for your book- am loving the photography already, but I especially like your acknowledgement of busy weekday breakys and how they are normally hurried! Porridge is my daily morning food and I always make it for my husband too. Although this version takes a bit more time, I am sure that it will become his favourite! And all the advice you give about about making porridge is really very useful, thank you! I hope your book does well! Good advice. I think I stir too much and what a relief to know improvement means doing less. Bravo! I like the way you broke your book into sections (Busy Weekdays, Slow Sunday, and Brunch). Very wise. I'm looking forward to seeing it all in print. And..thirty minutes seems a completely acceptable amount of time for achieving "sophisticated oatmeal" (fabulous term). I do prefer the toothsome, traditionally cooked oats like you describe, Megan, but there are days when breakfast does have to be gathered more quickly (for self and young ones), and it is helpful to know that even the "old-fashioned" (not steel-cut) oats can be cooked in the microwave for one minute, using a mix of 1/2 cup oats and 3/4 cup milk. Topped with nuts, fruit, and or a smattering of dark chocolate chips, it's a wholesome but quick breakfast... and maybe a nice middle ground for those who fall in between a preference for thin, watery, instant oatmeal, and those who like their oatmeal to hold a spoon upright. Thank you, Megan, for continuing to promote whole grains, as so many others are shunning gluten. Speaking for myself, I enjoy the varied tastes and textures and the satisfaction of a fiber-rich diet. Hi! I made this porridge just this morning and WOW...I LOVE IT! It made enough so that I can partake another couple of mornings! And your book sounded just too darn good not to sign up for early release...a little holiday gift to myself as breakfast is my fave meal of the day...THANK YOU! I was so happy to have this recipe and all the ingredients on hand the other morning when it snowed. Loved the subtle spices in the oatmeal and the cranberry compote. We're going to have it on again on Christmas morning with a choice of the cranberry sauce or your maple roasted apples from the class you taught at Delancy's last winter. Merry Christmas and thanks for all your "grainy inspiration". Also, can I just say that I adore your blog, I only just found it today and I love the way you write and your photography is beautiful. I'll definitely be adding you to my favourites!! What wonderful tips! I eat oatmeal almost every week day because I know it's healthy, fills me up and slips down my breakfast-phobic throat a little more easily than other brekky options. Thanks! I'm so delighted to have discovered you, Megan! Several of my favorite food bloggers are talking about and cooking from your new book. I look forward to your San Francisco visit in February. I'm excited to try this cranberry sauce on tomorrow morning's oatmeal. I make some kind of porridge almost every morning with my awesome rice cooker-- it's just so easy and everything comes out quite well. I love the sound of toasting the oats in butter though, so I think I am going to try adding this step. Thank you! Hi, Megan! 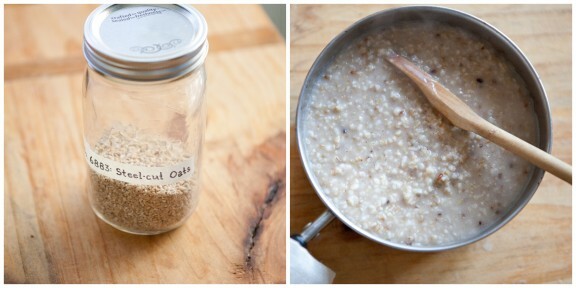 I first made your toasty steel-cut oatmeal last Friday after reading about it over at Orangette. I live alone and was out of town all weekend, yet am already working my way through Batch #2! Thanks for introducing me to such a simple-but-luxurious way of eating porridge--I have a feeling toasted oats are in my kitchen to stay. Congratulations on the publication of your book! Delicious! Thanks for the idea. I love muesli for breakfast. I am looking forward to try this recipe with oriental twist. This will be wirst thing in the morning I am gonna do. I hope that my kids will be thrilled. They like cinnamon.